The Settle Carlisle Railway Development Company operates the award-winning refreshment trolley service on the Settle-Carlisle route. Focusing on locally produced food, we offer a range of cakes and biscuits made by Country Fare in Mallerstang. Country Fare is based at a farm within sight of the line between Kirkby Stephen and Garsdale. Why not try one of their award-winning ginger biscuits, flapjacks or speciality shortbreads? Forget the calories, sit back and enjoy! Ale produced locally by Eden Brewery (based in Penrith) is available from the trolleys on the trains. The new range features canned Wyvern Blonde . Unique to the Settle Carlisle Railway, you will also be able to enjoy a locally made ice cream. With a variety of flavours available, why not indulge yourself with a delicious treat? We serve a wide range of hot and cold drinks including filter coffee, tea, hot chocolate, latte, water, fruit juice and a selection of confectionery, crisps and much more. We are conscious that hot drinks are served in single-use cups on the trains. Unfortunately, there are no facilities on board for washing cups and mugs. To help reduce the number of paper cups used, you can buy a reusable travel mug from the trolley team. When you buy a travel mug, you will receive a voucher for a free tea or coffee. We also stock a range of Settle-Carlisle Railway merchandise on the trolley including hessian bags for life, playing cards, and stationary as well as a great guide book to compliment your journey on the line. There may be occasions when, for circumstances beyond our control, we have no alternative but to withdraw a trolley service. 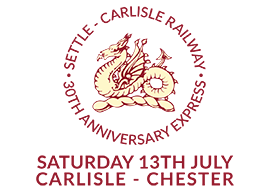 Click here for an exclusive Explore discount voucher for use on the on-board Settle-Carlisle Railway refreshment trolley. The voucher entitles you to one drink half price when purchasing a hot beverage. This voucher is valid until the 19th May 2019. If you wish to pre-order refreshments, our Catering Team will be happy to discuss your options. Packed lunches, cream teas, champagne and strawberries, birthday cakes and a host of other menu suggestions are available. If you are having a special day out on the train or celebrating a special occasion, we are here to help. Please email admin@settle-carlisle.co.uk.